Ain't Gonna Die Tonight *** *<br>Glorious *** **<br>Marmalade *** *<br>Willy Wonka *** *<br>Intentions *** *<br>Good Old Days *** **<br>Levitate *** *<br>Firebreather *** *<br>How To Play The Flute *** *<br>Ten Million *** *<br>Over It *** *<br>Zara *** *<br>Corner Store *** *<br>Miracle *** *<br>Church *** *<br>Excavate *** *<br><br>4.125 - 4*<br><br>Nachdem meiner Meinung nach "This Unruly Mess I've Made" zurecht floppte, kehrt Macklemore nun eher zu der Form zurück, mit welcher er schon bei "The Heist" überzeugen konnte, dieses Mal sogar ohne Ryan Lewis. Ich bin ja nach wie vor alles andere als ein grosser Fan des Hip-Hop/Rap-Genres, doch Macklemore macht seine Sache eben recht gut. 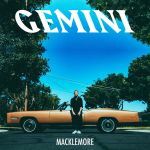 Die Singles "Glorious" und "Good Old Days" sind die klaren Highlights, sonst bietet "Gemini" gewohnt solide Kost von Macklemore. It's not bad, but there's nothing that hugely stands out here. Glorious was a nice track and one that I enjoyed really from the get go, same with Good Old Days. The things with his other mainstream albums is that they were good constant listens, with meaningful tracks and songs about real problems. This one, I don't think there's much of that, which is a shame to be fair. I like some of it but it's probably my least favourite of the three big albums of his. Saying that, there's nothing really bad (like Dance Off for example) so that's a positive. 3.8/6.